Savvas Ysatis and Taylor Deupree were at it again in Deupree’s country studio, about two years after the creation of 2007’s The Sleeping Morning EP. They gave themselves one week to see what they could create with the studio as a blank canvas, and the two emerged with Hourglass, four songs of carefully crafted pop-infused ambient music destined for release on 12” vinyl. 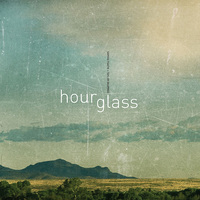 Hourglass follows in The Sleeping Morning’s footsteps with two instrumental pieces and two vocal songs created with a multitude of acoustic instruments, analog synthesizers and very little computer aided programming. The idea of treating the computer as a tape deck instead of a programming device was vital to their process as they surrounded themselves in the studio with as many noise-making objects as possible, shunning nothing if it could be used in interesting ways. “Clouds” opens the A-Side with a crisp and spacious arrangement fueled by Ysatis’ airy vocals and a warm, driving harmonica line over a bed of bass synths and looping autoharp. Utilizing room tones, microphones and treated guitar, “Hourglass” is a distant, longing and highly textured escape into ambient territory that the duo knows so well. Side B opens with the 2nd “poppish” song, “Like Ice On A Summer’s Day”, aptly titled for both its glistening and warm textures driven by acoustic guitar and the spacey swirls of a Jupiter-8. “Somewhere On Earth” closes out the EP in an organic mood where the whole studio becomes a live, swirling world of improvised instruments and playful experimentation. Hourglass is the much anticipated next step for Ysatis and Deupree who have been collaborating since 1994 and have been known for embracing many different genres with their critically acclaimed catalog of releases. The Hourglass 12” is limited to 400 numbered copies and comes packaged in a beautifully printed full color jacket. Each copy includes a coupon with a code to download both Flac and MP3 versions of the songs. Additionally, the EP will be available from 12k’s usual digital retailers.